Paranormal chick-lit at its finest, Girl's Guide to Witchcraft is absolutely perfect for women seeking a pick-me-up and escape from reality for a few hours. This book is the first in a trilogy from Mindy Klasky , author of the famed fantasy series Glasswrights' Guild. Jane Madison is an awkward, single librarian with the problem (so typical and prevalent in chick-lit novels) of finding the perfect man. Speaking of which, Jane has been mooning over "Imaginary Boyfriend" Jason Templeton for ages without any reciprocated feelings. When Jane moves into an old cottage behind the library, she discovers a hidden trove of ancient magical books that - voila! - make her realize she's got witchy powers. Just imagine what happens when the possibility of love spells abound! Jane's character is made out to be the ultimate cliched, nerdy librarian, but you can't help but like her in all her blundering awkwardness. Supporting characters Neko and Melissa, Jane's homosexual familiar and best friend respectively, add extra spice to the novel in their own hilarious ways. 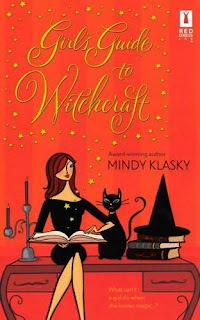 Girl's Guide to Witchcraft is supremely humorous and light, so in addition to just being plain enjoyable, the book is perfect for that down-and-out mood lift! Because Girl's Guide to Witchcraft is first in a trilogy, the beginnings of some great character developments are in the making. I'm really looking forward to reading the following novels in the series entitled Sorcery and the Single Girl and Magic and the Modern Girl .